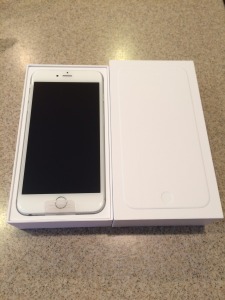 I got my iPhone 6+ today in the mail. I love apple products. I like their design and style. They look clean and modern to me. I have friends who feel the same way about their androids. I think both types of phones are great and each have their own pros and cons. I’m not here to tell anyone what to buy or which product is better than which other product. My family uses apple products (including my grandma who just upgraded to the iPhone 6:) ). The biggest features I look forward to Apple Pay, the upgraded camera and battery in the 6+. I will keep you updated on how these features work.